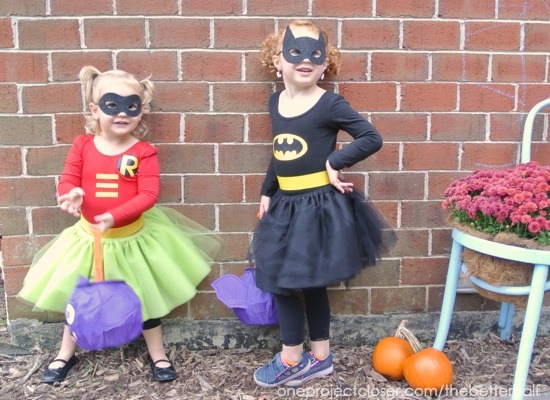 DIY Batgirl and Robin Girl Costumes! 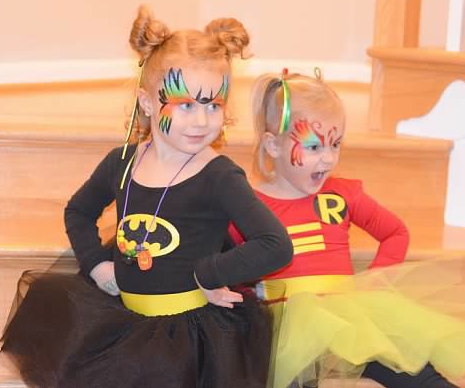 This Halloween was all about the Batgirl and Robin girl costumes! I was actually surprised how excited both our girls were about these costumes since they’ve never seen Batman and the costumes weren’t of the Princess variety. Although, in all fairness, they did involve glitter and very big tutus! lol. I pushed for a family theme costume this year because my good friend, Ruth threw a Halloween party where costumes were mandatory for all! I found my inspiration for the girl’s costumes on Pinterest (but with no link, boooo!) and from there decided that Ethan and I would be the villains – Scarecrow and the Riddler. Our were super easy, especially Ethan’s since I just used burlap and embroidery thread I already had on hand. This was all of us at the party. Ruth, also an AMAZING photographer, hired a face painter. So here we are, captured on film by Ruth! Thanks, Ruth. 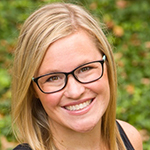 Be sure to check Ruth out on FB. This pic of the girls is maybe one of my all-time photos. Every Halloween, we Trick or Treat with our neighborhood friends, and this year we had pizza at our house first. The kids (and adults) had so much fun! 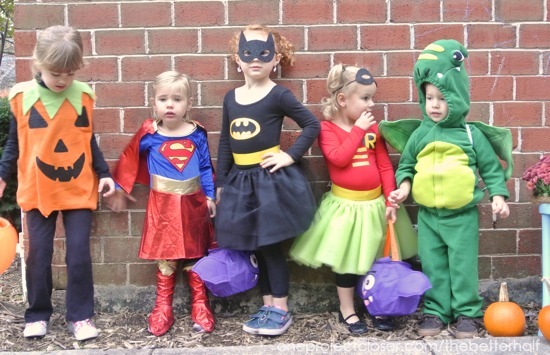 Here’s our neighborhood justice league! Here’s a quick tutorial with tips on how I made the costumes, if you wanna make your own Batgirl and Robin costumes. 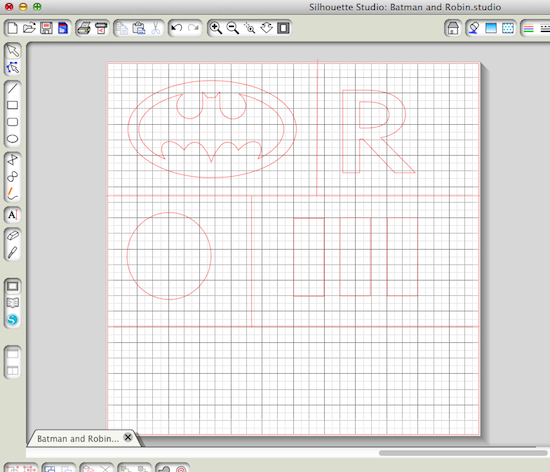 I created a stencil for the Batgirl and Robin logos on my Silhouette. You can email me for the file or you can print it off and use a stencil cutter. Before applying the stencil to the leotard, I measured the girl’s chest. Both were 22′ around. So I cut out piece of cardboard 11″ across and put it in the leotard. This way the logo doesn’t stretch and crack once it is worn. I painted the logos and Robin’s stitching on the leotoard (on the cardboard form) using Deco Art’s Multi-surface Craft Paint. The yellow needed lots of coats of paint. Once the paint was dry, I sprayed it all with Tulip Fabric Spray Paint Glitter. The tutus were the easiest part! I bought 3 yards of tulle each. I layed one color with as many layers as possible out and folded it in half. The more layers the thicker and fuller the tutu. Once folded in half, I pinned at the fold and then sewed a straight seam about an inch to inch and a half from the fold. Then, using a pencil with the elastic attached (about 20″), I threaded the elastic through the pocket and sewed the two ends together. DONE and EASY! I used about 18 inches of yellow 1.5″ ribbon and attached it to about 4 inches of elastic in the back to form a loop. One belt, I sewed and the other I hot glued and both held great! I used black glitter felt for the masks, free-handing them and adding elastic. For the record, I did NOT tell Izzie to pose like that – she’s just naturally dramatic…like her momma! lol. What do you think? What should we start work on for next year? 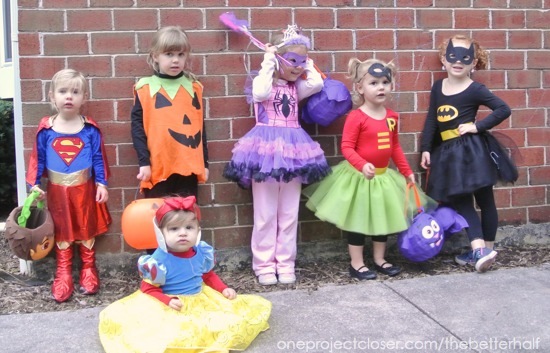 Jocie, these costumes are absolutely adorable!! What a great way to create them. Thanks for sharing this tutorial. SO so cute! And those costumes aren’t bad either 😉 You are one creative momma! The costumes came out so super cute! I just love all the sass in that last picture! What an adorable family you have! 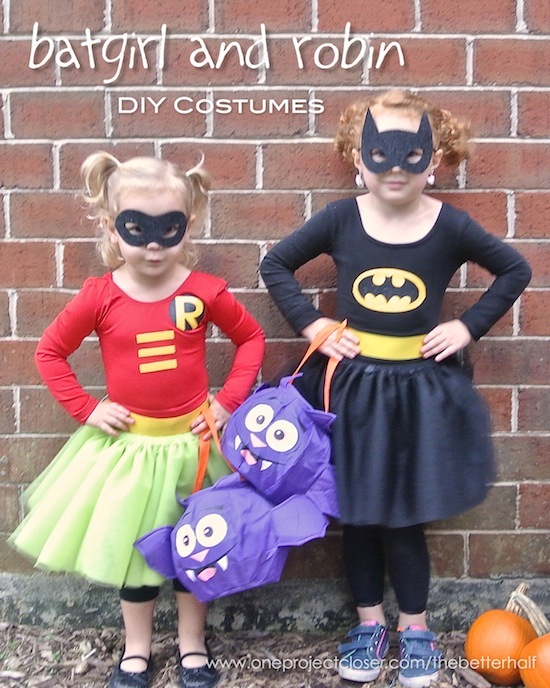 How original to turn the Batman and Robyn into cute girl costumes. I miss those days!!!! 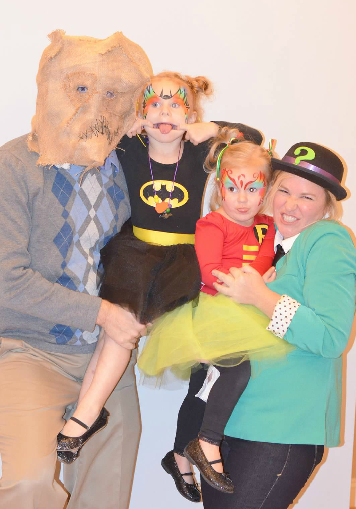 Jocie, your daughters look adorable in their costumes. 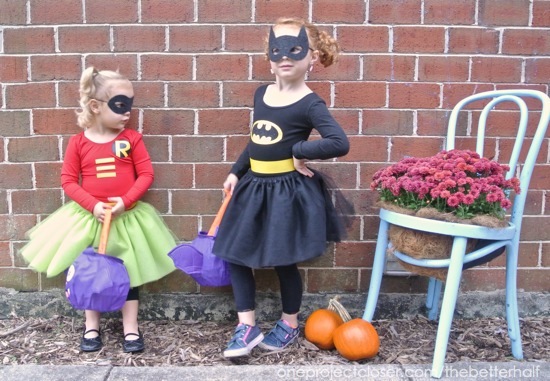 Cutest Batgirl and Robin I’ve ever seen! Love their costumes! They both look absolutely adorable! We don’t celebrate Halloween but we have a similar holiday (around Feb-March). I remember my Mom making all my costumes – such fun!! 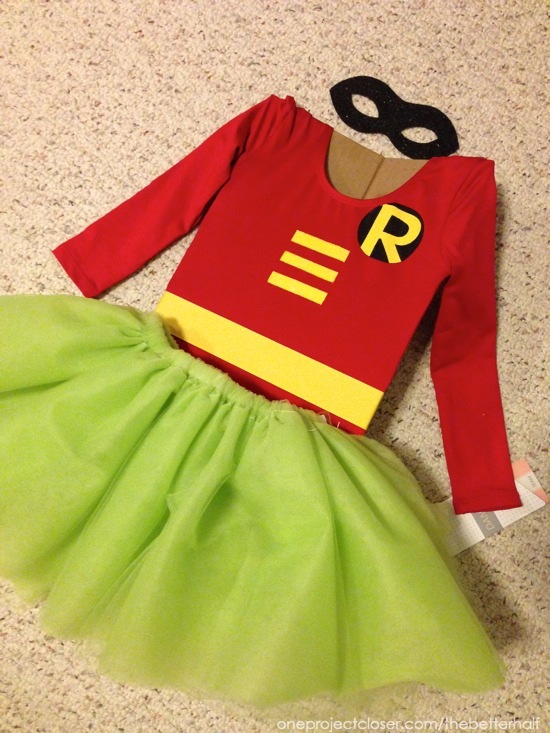 Nowadays most people buy them and they have no idea what they’re missing…..
Love their costumes, I am trying to find a red leotard for a 12 month old, where did you find yours?